Look for a quick appetizer or side? 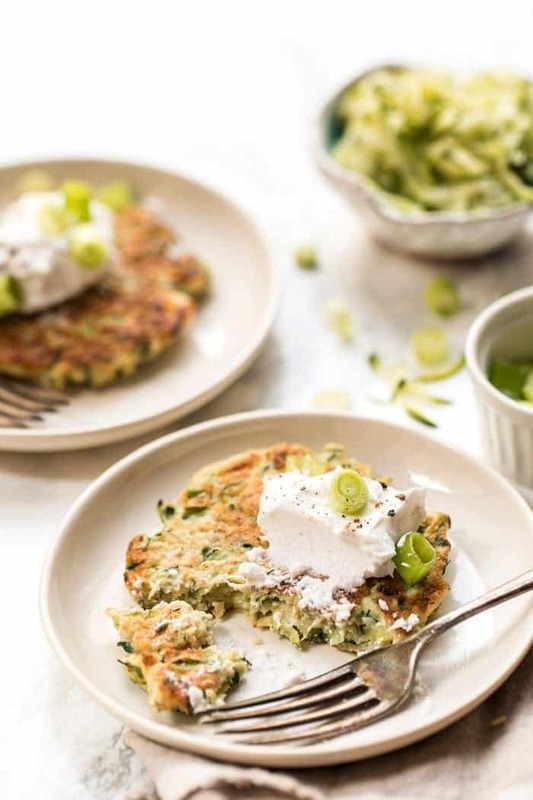 These Healthy Zucchini Fritters use just 5 ingredients and are ready in about 20 minutes. They're also naturally gluten-free and high in protein! 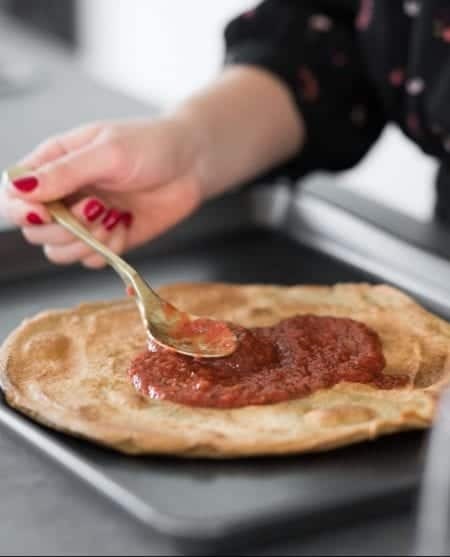 Ever been in the scenario where you have people coming over for dinner that night and have zero clue what you're making? Yea, me too. 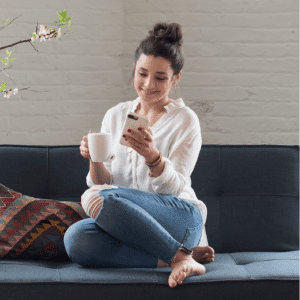 It's stressful, it's exhausting and it kind of makes the whole idea of hosting not too appealing. Let's start with our zucchini. 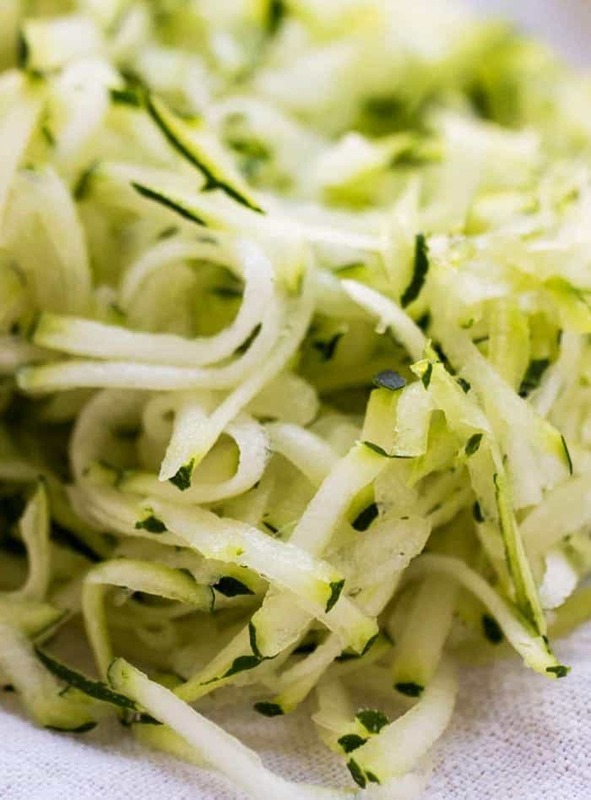 We're using shredded zucchini in this recipe and since zucchini is 95% water, it's important that we drain it of the liquid. The easiest way I have found to do this is to grate the zucchini, transfer it to a clean dish towel and then squeeze out the water. 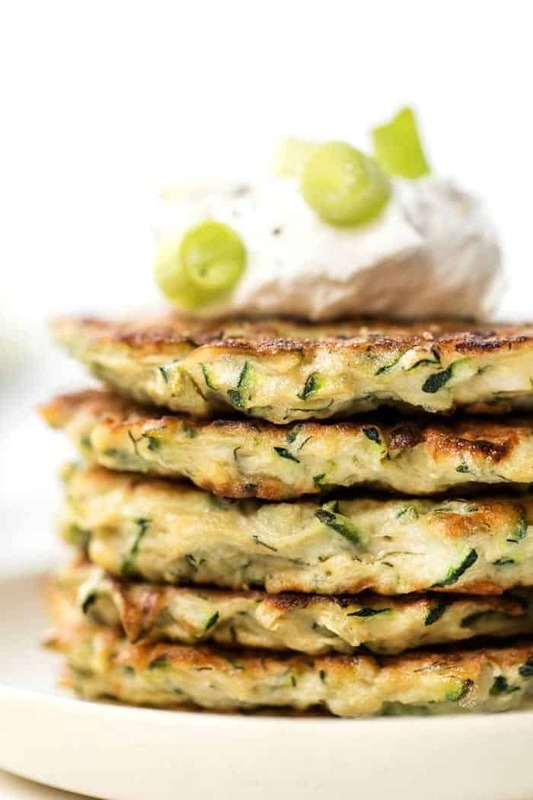 From there, your zucchini should be nice and dry, perfect for these fritters! Then we essentially just add everything to a bowl, stir it together and then sear them up! Also, these can be saved for later and reheated! I like to actually reheat mine in the toaster oven and use them as a “toast”. 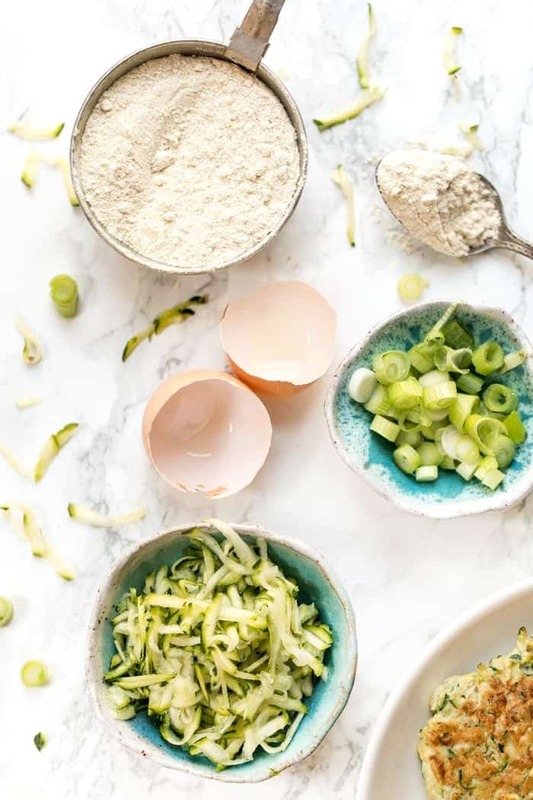 Rather than toasting up some bread, I'll toast a few of these healthy zucchini fritters, top them with my favorite sandwich toppings and make eat them like an open-faced sammie. 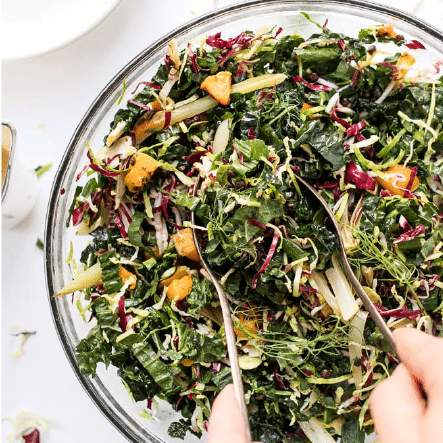 So simple, a great way to sneak some in some extra veggies and seriously delicious! 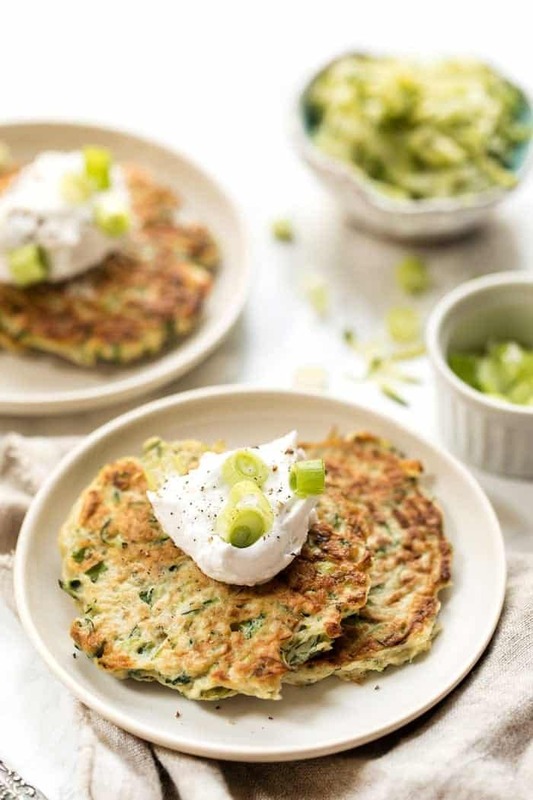 These healthy zucchini fritters are a quick and easy recipe, perfect for summer! Ready in about 20 minutes, using just 5 ingredients, they make for a great appetizer or snack! Add the zucchini to a clean dish towel. Squeeze out all the water and transfer it to a bowl. To the bowl, add the flour, scallions, eggs, salt and pepper. Stir the mixture together with a spatula or wooden spoon until combined. Add 2 - 3 tablespoons of coconut oil into a large skillet over medium-high heat. Once the oil is hot, form small patties out of the zucchini mixture in your hands. Serve slightly warm as is or with your favorite sauce! 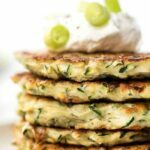 In making zucchini fritters if i don’t want to use eggs.what i can use instead of it. I haven’t tested these without eggs, so I’m not entirely sure. Sorry! If formed into patties and baked, what temp for how long? I haven’t tested them baked, so I’m not sure! How many fritters in a serving?how many fritters in a batch? How about using serialized Broccoli stems? The store here leaves long thick stems on the fresh Broccoli and discarding them is against my thrifty soul. I usually just add to the flower heads, steam and add seasoning for a side. I made these with oat flour. Delicious! Will definitely make again. Can these be frozen and reheated in microwave? Could one do this with a flax egg? Interesting recipe. I too would like to know if other flours can be subbed for the quinoa, like even rice flour? These look great! Love that they can reheat too. I’m always looking for sneaky ways to add in more veggies! Yes!! We just made another batch and they were the perfect lunch 🙂 hope you love them! Great recipe! 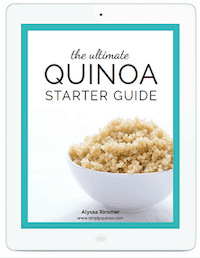 Can we sub the quinoa flour for almond flour? Would these still bind together if I replaced the eggs with flax eggs? Thanks! These turned out AMAZING! I made them yesterday, using flax eggs (with a 1:2.5 ratio) and they were perfect, the texture was spot on and flavor was incredible. I made a few of them as fritters and the rest i poured into a 9×13 baking dish (I doubled the recipe). SO good! My entire family loved them. Thank you for sharing! I baked it at 375 for around an hour. I should note, I also used chickpea flour, since I’m allergic to quinoa. THANK YOU for sharing your experience with the substitution. I will give these a try soon! YAY!!! So happy to hear this 🙂 So they didn’t fall apart when they were fritters? Amazing! I haven’t tested them that way yet!! So I’m not totally sure. You might need to tweak the ingredients a little and perhaps let it sit for a while longer. Hi! Typo for sweet potato in ingredients, but great idea!! 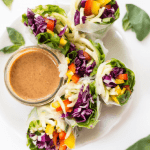 These are so up my alley and a great partner for my tahini addiction! I love your recipes! Channeling my thoughts, cravings, curiosity. Hello. 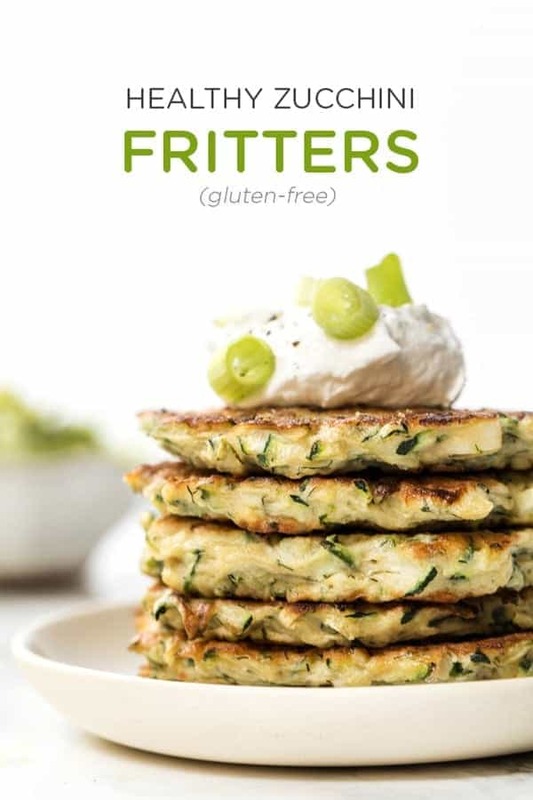 I’m curious about the zucchini fritters. You stated sweet potatoes in the instructions but not in the ingredients. How much is required for the recipe?